As you’ll remember, #HotCriminal, a.k.a. 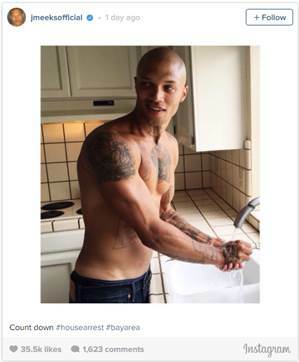 Jeremy Meeks, became a viral sensation when his mug shot graced the Internet back in the summer of 2014. Released from jail this past March for possession of a loaded firearm, Meeks has gained an allegiance of fans who have swooned over his blue eyes and chiseled face. Once he was a free man, there was much talk he’d actually dip his feet in the modeling world – and alas, this outlandish wish has been granted. 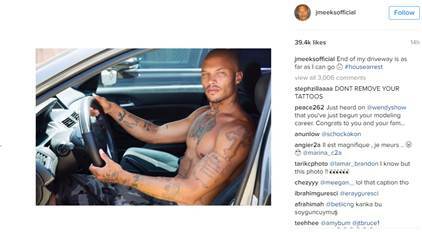 Now with an Instagram following of 373k and counting, Meeks has posted three modeling photos in the past week for the first time ever, after being inactive on his page for months. Considering that his Insta only has 8 photos and he is STILL receiving this type of interest and attention, it’s safe to say that Meeks has a legitimate shot at making a living in the industry. Whilst we not forget this guy has a criminal record, it’s clear that his looks are resonating with ladies and gents across the land, and hey, everyone deserves a second chance right? From striking out with the feds to striking a pose – 2016 looks like it may be #HotCriminal’s year!